Woodrow Charles Herman (May 16, 1913 – October 29, 1987) was an American jazz clarinetist, saxophonist, singer, and big band leader. Leading various groups called "The Herd", Herman came to prominence in the late 1930s and was active until his death in 1987. His bands often played music that was cutting edge and experimental for its time; they received numerous Grammy nominations and awards. Herman was born in Milwaukee, Wisconsin, on May 16, 1913. His parents were Otto and Myrtle (Bartoszewicz) Herman. His mother was Polish. His father had a deep love for show business and this influenced Woody Herman at an early age. As a child he worked as a singer and tap-dancer in Vaudeville, then started to play the clarinet and saxophone by age 12. In 1931, he met Charlotte Neste, an aspiring actress; they married on September 27, 1936. Woody Herman joined the Tom Gerun band and his first recorded vocals were "Lonesome Me" and "My Heart's at Ease". Herman also performed with the Harry Sosnick orchestra, Gus Arnheim and Isham Jones. Isham Jones wrote many popular songs, including "It Had to Be You" and at some point was tiring of the demands of leading a band. 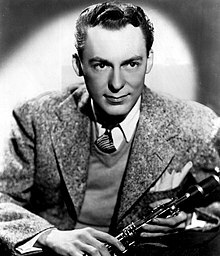 Jones wanted to live off the residuals of his songs; Woody Herman saw the chance to lead his former band, and eventually acquired the remains of the orchestra after Jones' retirement. Woody Herman's first band became known for its orchestrations of the blues, and was sometimes billed as "The Band That Plays The Blues". This band recorded for the Decca label, at first serving as a cover band, doing songs by other Decca artists. The first song recorded was "Wintertime Dreams" on November 6, 1936. In January 1937 George T. Simon closed a review of the band with the words: "This Herman outfit bears watching; not only because it's fun listening to in its present stages, but also because it's bound to reach even greater stages." After two and a half years on the label, the band had its first hit, "Woodchopper's Ball" recorded in 1939. Woody Herman remembered that "Woodchopper's Ball" started out slowly at first. "[I]t was really a sleeper. But Decca kept re-releasing it, and over a period of three or four years it became a hit. Eventually it sold more than five million copies—the biggest hit I ever had." In January 1942, Herman would have his highest rated single (#1 in the Billboard charts), singing Harold Arlen's "Blues in the Night" backed by his orchestra. Other hits for the band include "Blue Flame" and "Do Nothin' Till You Hear from Me". Musicians and arrangers that stood out included Cappy Lewis on trumpet and saxophonist/arranger Deane Kincaide. "The Golden Wedding" (1941), arranged by James "Jiggs" Noble, was notable for its extended (34 bars) drum solo by Frankie Carlson. In jazz, swing was gradually being replaced by bebop. 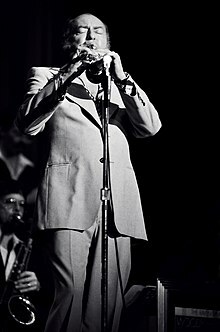 Dizzy Gillespie, a trumpeter and one of the originators of bop, wrote three arrangements for Woody Herman, "Woody'n You", "Swing Shift" and "Down Under". These were arranged in 1942. "Woody'n You" was not used at the time. "Down Under" was recorded July 24, 1942. The fact that Herman commissioned Gillespie to write arrangements for the band and that Herman hired Ralph Burns as a staff arranger, heralded a change in the style of music the band was playing. In February 1945, the band started a contract with Columbia Records. Herman liked what drew many artists to Columbia, Liederkranz Hall, at the time the best recording venue in New York City. The first side Herman recorded was "Laura", the theme song of the 1944 movie of the same name. Herman's version was so successful that it made Columbia hold from release the arrangement that Harry James had recorded days earlier. The Columbia contract coincided with a change in the band's repertoire. The 1944 group, which he called the First Herd, was famous for its progressive jazz. The First Herd's music was heavily influenced by Duke Ellington and Count Basie. Its lively, swinging arrangements, combining bop themes with swing rhythm parts, were greatly admired. As of February 1945 the personnel included Bill Harris, Sonny Berman, Pete Candoli, Billy Bauer (later replaced by Chuck Wayne), Ralph Burns, Davey Tough and Flip Phillips. On February 26, 1945 in New York City, the Woody Herman band recorded "Caldonia". Neal Hefti and Ralph Burns collaborated on the arrangement of "Caldonia" that the Herman band used. "Ralph caught Louis Jordan [singing "Caldonia"] in an act and wrote the opening twelve bars and the eight bar tag." "But the most amazing thing on the record was a soaring eight bar passage by trumpets near the end." These eight measures have wrongly been attributed to a Gillespie solo, but were in fact originally written by Neal Hefti. George T. Simon compares Hefti with Gillespie in a 1944 review for Metronome magazine saying, "Like Dizzy [...], Hefti has an abundance of good ideas, with which he has aided Ralph Burns immensely". In 1946 the band won Down Beat, Metronome, Billboard and Esquire polls for best band, nominated by their peers in the big band business. Along with the high acclaim for their jazz and blues performances, classical composer Igor Stravinsky wrote the Ebony Concerto, one in a series of compositions commissioned by Herman with solo clarinet, for this band. Herman recorded this work in the Belock Recording Studio in Bayside New York. Throughout the history of jazz, there have always been musicians who sought to combine it with classical music. Ebony Concerto is one in a long line of music from the twenties to the present day that seeks to do this. Herman said about the Concerto: "[The Ebony Concerto is a] very delicate and a very sad piece." Stravinsky felt that the jazz musicians would have a hard time with the various time signatures. Saxophonist Flip Philips said, "During the rehearsal [...] there was a passage I had to play there and I was playing it soft, and Stravinsky said 'Play it, here I am!' and I blew it louder and he threw me a kiss!" In his own original way Stravinsky noticed the massive amount of smoking at the recording session: "the atmosphere looked like Pernod clouded by water." Ebony Concerto was performed live by the Herman band on March 25, 1946 at Carnegie Hall. Despite the Carnegie Hall success and other triumphs, Herman was forced to disband the orchestra in 1946 at the height of its success. This was his only financially successful band; he left it to spend more time with his wife and family. During this time, he and his family had just moved into the former Hollywood home of Humphrey Bogart and Lauren Bacall. One reason Herman may have disbanded was his wife Charlotte's growing problems with alcoholism and pill addiction. Charlotte Herman joined Alcoholics Anonymous and gave up everything she was addicted to. Woody said, laughing, "I went to an AA meeting with Charlotte and my old band was sitting there." Many critics cite December 1946 as the actual date the big-band era ended, when seven other bands, in addition to Herman's, dissolved. In 1947, Herman organized the Second Herd. This band was also known as "The Four Brothers Band". This derives from the song recorded December 27, 1947, for Columbia records, "Four Brothers", written by Jimmy Giuffre. "The 'Four Brothers' chart is based on the chord changes of 'Jeepers Creepers', and features the three-tenor, one-baritone saxophone section". The order of the saxophone solos is Zoot Sims, Serge Chaloff, Herbie Steward, and Stan Getz. Some of the notable musicians of this band were also Al Cohn, Gene Ammons, Lou Levy, Oscar Pettiford, Terry Gibbs, and Shelly Manne. Among this band's hits were "Early Autumn", and "The Goof and I". The band was popular enough that they went to Hollywood in the mid-nineteen forties. Herman and his band appear in the movie New Orleans in 1947 with Billie Holiday and Louis Armstrong. Herman's other bands include the Third Herd (1950–56) and various later editions during the 1960s. In the 1950s, the Third Herd went on a successful European tour. He was known for hiring the best young musicians and using their arrangements. In the early and mid 1960s, Herman gained a wider recognition by fronting one of the most exciting Herds to date that featured future stellar names like Michael Moore, drummer Jake Hanna, tenor saxophonist Sal Nistico, trombonists Phil Wilson and Henry Southall and trumpeters like Bill Chase, Paul Fontaine and Dusko Goykovitch. By 1968, the Herman library came to be heavily influenced by rock and roll. He was also known to feature brass and woodwind instruments not traditionally associated with jazz, such as the bassoon, oboe or French horn. In the early 1970s he toured frequently and began to work more in jazz education, offering workshops and taking on younger sidemen. For this reason he got the nickname Road Father and the bands were known as the "Young Thundering Herds." In January 1973, Herman was one of the featured halftime performers at Super Bowl VII. In 1974, Woody Herman's band appeared without their leader for Frank Sinatra's television special The Main Event and subsequent album, The Main Event – Live. Both were recorded mainly on October 13, 1974, at Madison Square Garden in New York City. On November 20, 1976, a reconstituted Woody Herman band played at Carnegie Hall in New York City, celebrating Herman's fortieth anniversary as a bandleader. By the 1980s, Herman had returned to more straight-ahead jazz, but augmented with some of the newer rock and fusion approaches. Herman signed a recording contract with Concord Records around 1980, now called the Concord Music Group. In 1981, John S. Wilson warmly reviewed one of Herman's first Concord recordings "Woody Herman Presents a Concord Jam, Vol. I". Wilson's review says that the recording presents a band that is less frenetic than his bands from the forties to the seventies. Instead it takes the listener back to the relaxed style of Herman's first band of the thirties that recorded for Decca. Herman continued to perform into the 1980s, after the death of his wife and with his health in decline, chiefly to pay back taxes that were owed because of his business manager's bookkeeping in the 1960s. Herman owed the IRS millions of dollars and was in danger of eviction from his home. With this added stress, Herman still kept performing. In a December 5, 1985, review of the band at the Blue Note jazz club for The New York Times, John S. Wilson pointed out: "In a one-hour set, Mr. Herman is able to show off his latest batch of young stars—the baritone saxophonist Nick Brignola, the bassist Bill Moring, the pianist Brad Williams, the trumpeter Ron Stout—and to remind listeners that one of his own basic charms is the dry humor with which he shouts the blues." Wilson also spoke about arrangements by Bill Holman and John Fedchock for special attention. Wilson spoke of the continuing influence of Duke Ellington on Woody Herman bands from the nineteen forties to the nineteen eighties. Before Woody Herman died in 1987 he delegated most of his duties to leader of the reed section, Frank Tiberi. Tiberi leads the current version of the Woody Herman orchestra. Tiberi said at the time of Herman's death that he would not change the band's repertoire or library. Herman had a Catholic funeral on November 2, 1987, at St. Victor's in West Hollywood, California. He is interred in a niche in the columbarium behind the Cathedral Mausoleum in the Hollywood Forever Cemetery. Awards won by the various Woody Herman orchestras with major publications: "Voted best swing band in 1945 Down Beat poll; Silver Award by critics in 1946 and 1947 Esquire polls; won Metronome poll, band division, 1946 and 1953. A documentary film titled Woody Herman: Blue Flame- Portrait of a Jazz Legend was released on DVD in late 2012 by the jazz documentary filmmaker Graham Carter, owner of Jazzed Media, to salute Herman and his centenary in May 2013. Between 1937 and 1956, Woody Herman had numerous hits on Billboard's charts. 1963 Encore: Woody Herman – 1963 136 (Aug.
Honorary doctorate, Berklee College of Music, 1977. ^ Lees, Gene (1997). Leader of the Band. Oxford University Press. p. 4. ISBN 0-19-511574-0. ^ Woody Herman changed the spelling of the familial name. ^ "a cordial welcome to jazzsight". Jazzsight.com. Retrieved 2016-04-10. ^ Visser, Joop (2000). The Woody Herman Story liner notes. Kent, England: Proper. p. 7. ^ a b "Woody Herman Biography – Music Artist Band Biographies – Artists Bands Bio – FREE MP3 Downloads". Music.us. Retrieved 2013-07-02. ^ Clancy, William D (1995). Woody Herman: Chronicle of the Herds. Music Sales Corp. p. 4. ISBN 0-8256-7244-9. ^ Simon, George T. (1971). Simon Says: The Sights and Sounds of the Swing Era. New York: Galahad Books. p. 73. ISBN 0-88365-001-0. ^ "Woody Herman Biography". Net Industries. 2009. ^ Jeremy Sibson. "Analysis of Drum Solos from Golden Wedding 1941 and 1976". Retrieved 15 January 2015. ^ "Soundtracks For Laura". Internet Movie Data Base. ^ McLellan, Dennis (October 15, 2008). "Ex-big band trumpeter, arranger and composer". Los Angeles Times. ^ Liner notes of the re-release by the Everest Recording Group Inc. in 1959, and released in January 1959 as SDBR 3009. The recording has been released on a CD by Everest EVC 9049. ^ "Jazz and Stravinsky". BBC. 2009. ^ "Classical Arts". Center for Jazz Arts. Archived from the original on 2012-02-06. Retrieved 2013-07-02. ^ "Finally, in December, 1946, almost a dozen years after Benny Goodman had blown the first signs of life into the big band bubble, that bubble burst with a concerted bang. Inside of just a few weeks, eight of the nation's top bandleaders called it quits-some temporarily, some permanently". George T. Simon The Big Bands Schirmer Books, New York. 1981. p.32 ISBN 0-02-872420-8. ^ "New Orleans (1947)". IMDb.com. Retrieved 2013-07-02. ^ "Woody Herman". Verve Music Group. 1999–2009. ^ "1973 Super Bowl VII". super-bowl-history.us. Archived from the original on December 24, 2011. ^ "Michigan Band Super Bowl VII halftime 1973 Remaster Part 1 of 2". Retrieved January 25, 2018 – via YouTube. ^ Wilson, John S. (March 15, 1981). "Woody Herman Jamming As Old". The New York Times. ^ Wilson, John S. (December 5, 1985). "Jazz: Woody Herman's Band". The New York Times. ^ "Bio". Franktiberi.com. Retrieved 2013-07-02.